On Friday, Spain will witness the most spectacular eclipse in 10 years. Let i-Marbella fill you in on where to get the best view! On the morning of Friday, March 20, Europe will be plunged into dimness during the most complete solar eclipse in 10 years, when the moon passes in front of the sun. 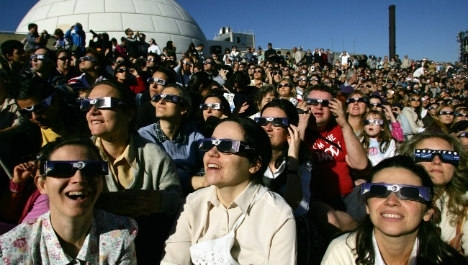 Spain last witnessed a solar eclipse in 2005. In 1999, Europe witnessed the last total eclipse of the millennium. The eclipse can be seen in Spain between 8.57am and 11.29am on Friday March 20. In Madrid, the eclipse will start at 9.04am and last until 11.18am. According to Spain's National Astronomical Observatory (OAN), the moment of maximum eclipse will happen at 10.08am (pictured). In Barcelona, the eclipse will begin at 9.11am and last until 11.27am. Where is the best place to watch the eclipse? While the eclipse will be visible across the entire country, the intensity will differ depending on where in Spain you are. A Coruña, in Galicia in the north east of the country will enjoy the best views of the eclipse (76 percent darkness), with the experience decreasing in intensity the further south you go. The Canary Islands will experience the lowest intensity eclipse with around 45 percent darkness. Will it even be that impressive? It is not a total eclipse, so the effect will be much more gradual than an end-of-the-world plunge into darkness. "If it was a total eclipse like it will be in the Faroe Islands, it would be very noticeable, but (here in Spain) it will be much more gradual," astronomer Mario Tafalla told the Spanish Huffington Post. Cameras and phones should also not be pointed directly at the sun, which could damage their lenses -- make sure to protect your camera equipment on Friday.